- Respond to faster reporting cycles. - Manage increased controls and governance. Getting answers from data in your systems is hard enough. Getting it from social networks and other unstructured data sources is even harder. This session is designed to answer your questions around how as a marketer you can get the right actionable information to understand your customers. The best part is that you can do it yourself without having to wait for IT to run reports for you. View this webcast and explore what you can do as a HR professional to help your company win in this new era. Hear from Mr. Bavneesh Gulati, Sr. Vice President – Human Resources from Kalpataru Ltd as to how they have deployed Oracle technology to modernize their operations. Following Mr. Bavneesh Gulati, Alison Sibree, Vice President, Human Resources at Oracle for APAC & Japan will explain how Oracle has changed to meet the challenges of modern HR and the strategies and technologies that have been deployed to attract, nurture and motivate talent. - Why MySQL on Oracle Linux? - What are features and plugins that makes MySQL Enterprise Edition so valuable? - Why is Oracle Linux considered to be the most advanced Linux OS? - How MySQL + Oracle Linux achieve high availability without the need of shared storage? - What is covered under Oracle premier support for MySQL and Oracle Linux? In this webcast, we will describe a new approach to mobile security that unlocks user productivity and lowers total cost of ownership. We will provide case studies of organizations that have simplified mobile security and improved user experience. Oracle Mobile Platform enables organizations to develop, deploy, integrate, secure, and manage enterprise mobility. In this online event, you will hear directly from featured analyst firm Gartner about the current mobile trends and challenges. Oracle Mobile executives will also outline Oracle’s overall mobile strategy, and discuss how Oracle Mobile Platform leverages current platform investments to simplify enterprise mobility. By leveraging the right mobile technologies, IT has an opportunity to work with line-of-business leaders to establish cross-channel mobile strategy for the enterprise. 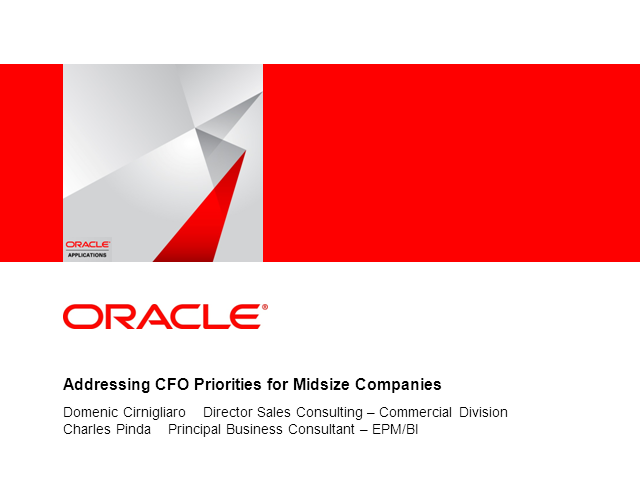 The role of the CFO continues to evolve. Today, CFOs must find new ways to sustain performance and grow the business, no longer focusing only on reporting and compliance. We very recently unveiled the new data integration product releases, Oracle Data Integrator (ODI) 12c and Oracle GoldenGate 12c, in this Webcast. The web and social channels have transformed the way people purchase. According to Corporate Executive Board, buyers are 57% through their buying process before engaging with salespeople. In modern day buying, customers are no longer interested in cold calls and generic emails with someone selling the basic features and benefits. They want insights, valuable information and high quality business knowledge. Join us for this complimentary webcast to find out how social selling offers the best ways to achieve this. • Leverage social networks from lead generation, to closed deal, account management and customer advocacy. Join us for this free webcast to learn how modern marketing concepts and technology can help you drive, and measure, effective marketing to boost revenue performance. Today’s opportunity is to make your company’s supply chain a strategic differentiator. What are the key business issues to solve and how are supply chain and logistics solutions delivering a return on investment? Recently 2 experts in the field of supply chains and logistics got together to discuss the key business drivers that are making companies invest in their supply chains. They covered a lot of ground, everything from costs and service levels through to how the most successful logistics and supply chain professionals are increasing their visibility and are now being seen as strategic, not just to the supply chain, but to the success of the business as a whole. This 20 minute video captures the highlights. Best Enterprise Linux. Lower Cost of Support. Oracle Linux delivers more value than Red Hat Enterprise Linux, with differentiated product features, higher-quality enterprise support, and overall lower cost of computing. Discover the benefits of running Oracle software and hardware on Oracle Linux, such as optimizations for Oracle engineered systems, thousands of hours of QA, and testing for deeper integration. With Oracle Linux, you get free access to the most advanced Linux operating system, better testing, integration with enterprise infrastructure and applications, and world-class support at a fraction of the cost. Why are leaders so important? Hear directly from David Rock, Director, NeuroLeadership Institute and the CEO, NeuroLeadership Group in this webcast. Hear about the SCARF model (Status, Certainty, Autonomy, Relatedness and Fairness) and how it will help you manage change and your teams in your organization. Then hear John Hansen discuss how HCM solutions can support this model. Join us for this Complimentary Webcast to learn about the cost-effective security solutions available to ensure your organisation is Payment Card Industry (PCI) Compliant. • The importance of not only meeting PCI compliance, but having the ability to audit and sustain compliance. • Encrypting PII data in applications requires costly and complex application changes. Fortunately, since this data typically resides in the application database, PII can be encrypted transparently by the Oracle database without any application changes. Learn how data encryption capabilities offer complete encryption for data at rest, in transit, and on backups, along with built-in key management to help organisations meet regulatory requirements and save money. • How detective controls can help you quickly detect and respond to threats by monitoring database traffic, detecting unauthorised activity including SQL injection attacks and blocking internal and external threats from reaching the database. • Enforcing least privilege and separation of duties through preventive controls at the database level. With the explosion in Mobile and Cloud you are faced with a tremendous opportunity to give users access to content anytime, anywhere. Is your organisation challenged to keep up? In order to tap the full power of your content and data, it must be transformed into actionable information that is easily accessible to the right user in the right context. Forward-looking organisations are moving towards centralising all their unstructured content on a single, scalable content management platform. Register today for this webcast on September 5. Don’t miss this opportunity to learn first-hand how Oracle Database 12c and Oracle Enterprise Manager 12c bring together the next evolution in self-manageability—making it easier and more efficient for you to manage Oracle Database 12c. Only Oracle Enterprise Manager 12c offers customers maximum performance, enhanced automation, and total control for Oracle Database 12c. Welcome to Business in the Age of the Empowered Consumer. Always Connected, Always On-the-Go, Always Informed. It’s the Age of Customer-centric Business. And it’s Every Company’s New Reality. Today’s Empowered Consumer lives in a multichannel, multi-device, digitally connected world where they can interact across a variety of touch points—globally and in real-time. The way businesses approach today’s empowered, multichannel consumer must be different. Yesterday’s old business models and technologies won’t work and of all the technologies, social is having the most profound effect. Upcoming events and on demand presentations. View live and on demand Webcasts on a wide range of topics covering Oracle Applications, Oracle Database, Oracle Fusion Middleware and Servers and Storage Systems.